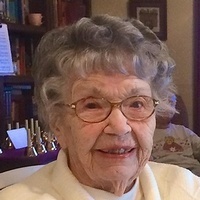 Margaret Thompson, of Sister Bay, WI, age 99, violinist and Charter Member of the Chicago area’s West Suburban Symphony Orchestra, widow of former Chicago-based actor Bob Thompson, passed away peacefully on August 27, 2018, at Door County Medical Center with her family by her side. Residents of Downers Grove, IL for over 50 years, in 2001 Margaret & Bob relocated to Sister Bay, WI, having been summer residents there for many years. Margaret (Porter) Thompson was born in Creston, Iowa on April 22, 1919, the only child of Pauline (Shaub) & Ernest Edman Porter. She received her Bachelor of Music degree from the University of Nebraska in 1940. After teaching music in the public schools of Ames, Iowa, Margaret obtained her Master of Music degree in violin performance from Northwestern University (Evanston, IL) in 1943. She was then hired as Director of the strings program in the Downers Grove public school system, a position she held from ’43-’46. During the summer of 1945, Margaret complied with her best friend Eleanor Thompson’s suggestion to begin writing letters to Eleanor’s brother, Robert Thompson, an aspiring actor, who was then serving with the Army Air Corps in the South Pacific. Margaret and Bob met finally in January of 1946, and were married on June 15, 1946. They were residents of Downers Grove for 56 years, and raised three children there, while also maintaining their professional careers. Margaret was Concertmaster of the West Suburban Symphony Orchestra for 40 years, and taught violin privately for many years. She returned briefly to teach strings at Downers Grove High School-North in the late ‘60s. Margaret also performed with the Downers Grove Choral Society (then known as the Oratorio Society), and other suburban musical organizations. Margaret and Bob both enjoyed successful performing careers, and supported each other in their professional lives. They were world travelers, supporters of all the arts, and for many summers, resided in Door County, WI due to Bob’s professional affiliation with the Peninsula Players. They embraced the diverse cultural activities that can be found in Door Co. They had been active members of the First United Methodist Church of Downers Grove, IL, and after moving to Sister Bay became members of the Shepherd of the Bay Lutheran Church. Survivors include three children, David (wife Haze) of Morgan Hill, CA; Kay (husband Doug Friedrich) of Pensacola, FL; and Don (wife Jean) of Ellison Bay, WI; granddaughters Shelley (Mrs. Matt) Singleton of Spring Arbor, MI; Carrie (Mrs. Mike) Gaerte of Indianapolis, and 5 great-grandchildren. She is also survived by a niece, Jean Moyer Powell (Mrs. Nat Powell) of Ann Arbor, MI, and nephew David Moyer of Petoskey, MI. Margaret was preceded in death by her husband Bob Thompson, who passed away in June 2010 in Sister Bay, WI. The family extends heartfelt thanks to Barb & Lou Pasquesi of Sister Bay for their assistance and loving care over the last several years, as well as to the many helpful friends at Shepherd of the Bay Lutheran Church in Ellison Bay, WI. The family also extends its deep gratitude to Martha Coventry, and staff, of Hearthside Cordial Care in Sister Bay. Arrangements are being handled by Casperson Funeral Home of Sister Bay (www.caspersonfuneralhome.com). Margaret's life will be honored with a memorial service held on Saturday, November 17 at 11:00 a.m. at Shepherd of the Bay Lutheran Church in Ellison Bay, WI with visitation beginning at 10:30 a.m. A light luncheon will follow the service. In Margaret’s memory, please consider making a donation to the Music Fund of the Shepherd of the Bay Lutheran Church in Ellison Bay, WI, the Peninsula Players of Fish Creek, WI, Peninsula Music Festival, or the West Suburban Symphony Orchestra of Hinsdale, IL.